By far the most frequently asked question on the blog is, “What’s the strumming for this?” It’s taken me about six months, but I think I’ve finally got an answer to that question. I don’t mind putting up strumming patterns, but the question really demands a permanent solution for people’s strumming woes. So I’ve written a new ebook: How to Play Ukulele Strums. I’ve been promising this one to a lot of people for a long time but I’ve been holding it back until until I was satisfied that it would be able to give everyone a strong understanding of rhythm and more confidence in their strumming. 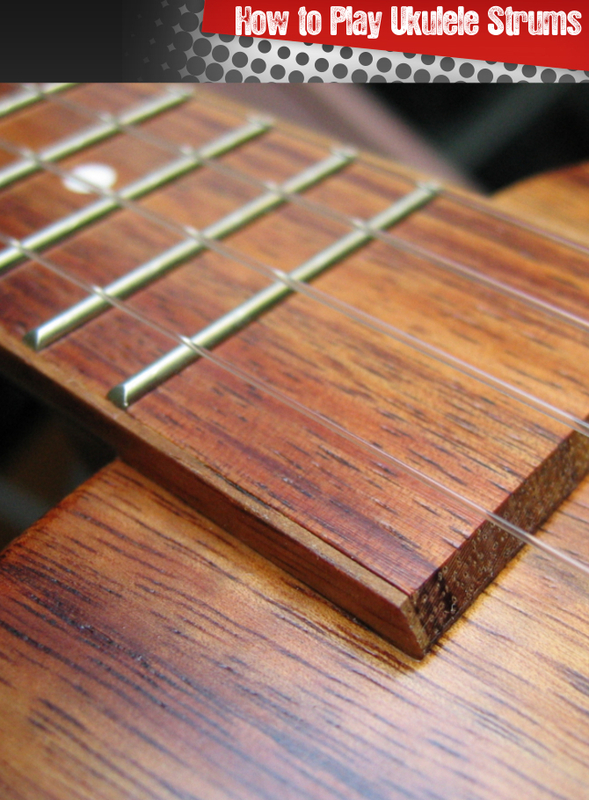 The problem is that there isn’t anything out there for the ukulele that gives you the ideas behind strumming patterns so you can work out strums for songs and come up with your own. They just give you a few patterns and leave you to get on with it. My aim with this ebook is to give you the knowledge to understand what’s going on behind the strums so you can play along with any song you choose. Knowing that a strumming pattern is down, up, up… is a good start, but you need to know how long each of those strums is supposed to last. So I’ve come up with a ukulele-brand based method that will help you get you strumming at the right time. It’s a case of matching up words to the length of the strums. It’s a simple way of doing it but it works great. Of course, I’m not going to neglect the strumming patterns themselves. The ebook contains a whole bunch of basic strumming patterns and some advanced ones in the style of ACDC, Nirvana, James Brown, Bo Diddley, The Specials and Bob Marley. There are mp3s of all the patterns (including slow and fast versions of most of them). If you ever have problems with your arm getting tired after strumming, or your playing doesn’t sound bright enough, or your strumming sounds a little raggedy, or you can’t get your chnking down; the ebook will help you sort out your technical gremlins. There are videos of the various techniques including basic strums, chnks, muting and triplets. This one is aimed at beginners and improvers who have learnt the basics but feel like there’s something about strumming that they’re just not getting. If you have trouble taking chord charts and matching them up to the song, or you feel like you’re muddling through and winging it a bit; it’ll increase your knowledge and confidence and improve your playing. Everything is explained really simply, so you don’t need to have any knowledge of musical theory going into the ebook. Thorough and thoroughly fantastic book! Thanks as always. I’m sure my flatmates will be very grateful for it as well. With time, my practicing will (hopefully) sound like actual music rather than the sort of abstract noise that it was before and my flatties can stop voluntarily banning themselves from home until it’s clear that I’ve moved on to another task for the day. In all seriousness: the book is wonderful, Thorough, easy to understand, and funny (as always). I am completely indebted to you for saving me from the depths of ukulele despair. I shall be recommending the ebook to our Monday Ukearist ukers as I know many of them are interested in improving their strumming. I’ll also be unashamedly stealing your mnemonic way of teaching! Al’s topped himself this time which I wouldn’t have thought possible after the blues book. This is a great read for beginners, but there are some strumming patterns at the end that are brilliant and will take some work to get the hang of. When I started playing four years ago, I had no idea there would be such a great wealth of information available. Al’s books, in my opinion, are better than anything I’ve found elsewhere, as far as written instruction goes. And, he is rather hilarious when he wants to be. I’ve already read this ebook more than 6 times and found something new with each read. A very important aspect for me was that the book covered basic things essential for strumming that are left out in other ukulele methods, such as rhythm and time signatures. The examples and the videos are really helpful and you can even test out your newly acquired sense of rhythm through the exercises. If there one book to buy on ukulele strumming, then it is definitely this one. …it’s definitely set up for everyone at any level to learn something new. I get frustrated when teachers take the small bits of knowledge that make a BIG difference to a new student for granted. Al does the opposite by making sure that everything is explained in an accessible way that takes the mystery out. Al’s teaching is very clear and well illustrated, and I would rec any of his work. I have Chord Progressions too; I will be working through that for awhile as well, there is just so much great information and there’s enough in each lesson to keep me interested and moving forward rather than get me discouraged like other books or authors. You’ll get a pdf file of the ebook and a pdf of a printable version of the file. You’ll also get mp3s files and WMV video files. They’ll all be in zip files (check out the FAQ page for more info). This one is slightly different to the way I’ve done it in the past. There are so many mp3s and videos that it made it too big for a single download. So you’ll get the pdf files as a single download (the same as my other ebooks) and the mp3s and videos will be a separate download. The links to all of them will be emailed to you automatically as soon as you buy. If you check out the ebook and you decide it isn’t for you, let me know within 7 days of purchasing and I’ll give you a full refund. Just email me and let me know the email address you bought it with – you don’t need to give me a reason or anything. If the ebook doesn’t make you a better player, I don’t want your money (because swimming around in it, Scrooge McDuck style, is only fun if you’ve earned it). How Can I Buy It? And How Much Is It? To order it click ‘Add to Basket’. If you’re reading this via email, head on over to the blog to get it. Once you’ve paid, click ‘Complete Purchase’ to be taken to the download page. You’ll also be sent a link to the download page by email. So don’t worry if you miss it. If you have any questions, leave a comment or send me a message.